Silly monkey. We don’t do that in the PNW. We go to farmers markets, recycle and avoid eye contact. I live in Arbor Heights, down near Lincoln Park. Been here 4.5 years now (originally from NY). Good to hear that you’re both feeling better. Took a quick trip to Colorado with my boyfriend this weekend. Went to Lookout Mountain in Golden and then to some gluten free breweries. Then we mainly just had time for Pikes Peak yesterday. Very pretty! And to top it all off - my boyfriend proposed to me at the very top of Pikes Peak! Lacey is all grown up! Thank you all! He couldn’t have done better with the ring either. Antique European cut diamond that’s in an Art Deco band from the 1920s/30s. Absolutely gorgeous! Congrats. Is the band made of platinum? 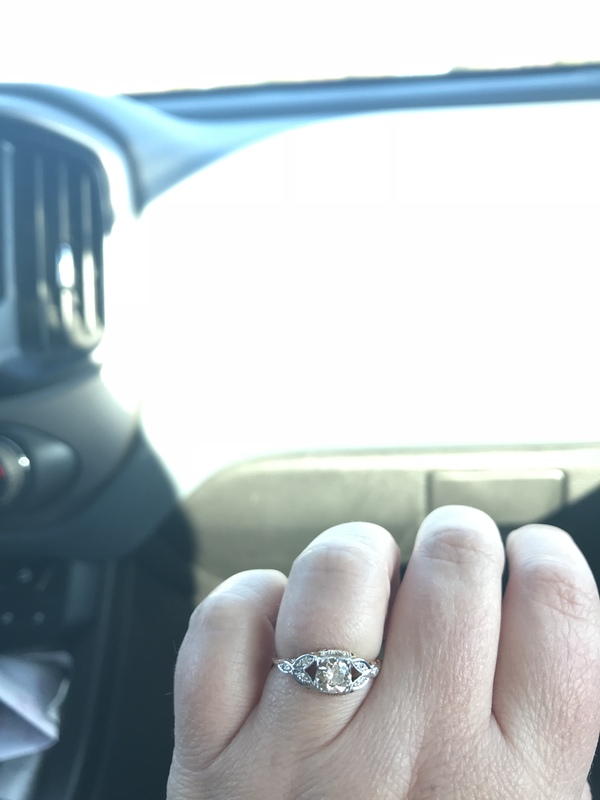 I bought my wife a similar 1920s ring (probably a smaller rock) and it was 90% plat 10% iridium, so the band by itself was fairly valuable. Nope - the band is yellow gold and I believe the lining on the top is white gold per the jeweler. He went to a small local business that has been around for years that had estate pieces. I definitely seem to trust them based on their reviews and them not trying to upsell. We had looked at a few places and went to one chain (Shane co) just to get an idea of what I may like. They found out he as an attorney and started bringing out $15k diamonds. I promptly made us leave. Yakitori sounds fantastic! Hope you guys had a great time! I took a look at their menu and everything looks very authentic!! It’s not yakitori but I love tomato buta bara. I see that they have Dasai on their sake list. That’s pretty impressive. Dasai sake is one of the best and is hard to come by. I hope you had lots of sake to go with the yakitori! It Was Oishiiiii Tomato Buta Bura and Asparagus with Wasabi Mayo !! Chicken Thigh/ Tenderloins with crunchy Garlic, Wombok Salad with hot oil and Bonito Flakes, Quail Eggs !! No Saki but Beer and Plum Wine.